Plasminogen is a single chain glycoprotein zymogen which is synthesized in the liver and circulates in plasma at a concentration of approximately 2.4 µM (1,2). The plasminogen molecule contains 790 amino acids, 24 disulfide bridges, no free sulfhydryls and 5 regions of internal sequence homology, known as kringles, between Lys77 and Arg560. These five triple-looped, three disulfide bridged, kringle regions are homologous to the kringle domains in t-PA, u-PA and prothrombin. Plasminogen contains one high affinity (Kd=9x10-6M) and four low affinity (Kd=5x10-3M) lysine binding sites. The high affinity binding site resides within the first kringle region of plasminogen. The interaction of plasminogen with fibrin and α2-antiplasmin is mediated by these lysine binding sites. Native glu-plasminogen (Mr=88,000) is readily converted to Lys-77-plasminogen (Mr=83,000) by plasmin hydrolysis of the Lys76-Lys77 peptide bond. Elastase catalyzed cleavage of the Val441-Val442 peptide bond of glu-plasminogen yields a functionally active zymogen termed Val-442 plasminogen or mini-plasminogen. 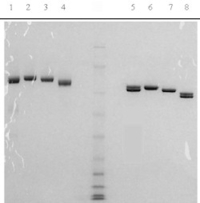 Native glu-plasminogen is prepared from fresh frozen human plasma by a modification of the procedure of Castellino (3), utilizing gel filtration and affinity chromatography. The two carbohydrate variants of glu-plasminogen (CHOI and CHOII) are isolated by gradient elution from lysine-Sepharose using the lysine analog, e-aminocaproic acid (3). The plasminogen is supplied in 50% (vol/vol) glycerol/H2O for storage at -20oC. Purity is determined by SDS-PAGE analysis. Robbins, K.C., Methods in Enzymology, 45, 257 (1976). Collen, D. in Blood Coagulation, Zwaal, R.E.A. and Hemker, H.C., eds., pp. 243-258, New York, Elsevier (1986). Castellino, F.J., et al., Methods in Enzymology, 80, 365 (1981). Wohl, R.C., et al., Thromb. Res., 27 523 (1982). Sottrup-Jensen, L., et al., in Progress in Chemical Fibrinolysis and Thrombolysis, Vol. 3, ed. J.F. Davidson, 7. R.M. Rowan, M.M. Samana, P.C. Desnoyers, pp. 197-228, New York: Raven Press (1975).